Use them to press and dry handmade papers. 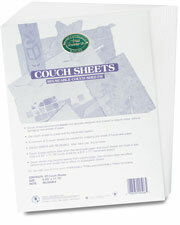 Couch (kooch) sheets are designed and treated to absorb water without damaging new sheets of paper. A minimum of two sheets are needed for pressing one piece. Reusable.